For Ed O’Keefe, a vintner in northern Michigan since 1974, every growing season is a test of survival. Wind damage, insects, cold snaps, and drought can all conspire to ruin a promising crop of riesling or pinot noir grapes. Just a 10-percent drop in annual production can mean a loss of millions of dollars in revenue. On the flip side, the traditional model of packaging, shipping, and dispensing wine from bottles impacts sales, as well. But while O’Keefe knows he can’t control Mother Nature, he has developed a high-tech solution to limit the abundance of wine that’s lost every year due to spoilage, theft, and over-pouring. “It always bothered me that we spend a great deal of time and energy producing the finest wines we can, but if someone comes into a restaurant and orders one glass from a new bottle, the rest of that bottle gets poured down the drain if no one else orders from it for a day or two,” says O’Keefe, founder and CEO of Chateau Grand Traverse on Old Mission Peninsula, just north of Traverse City. Over the last few years, O’Keefe has been tinkering with a novel distribution system for all types of wine. The new method involves packaging a case of wine into a cardboard box lined with an airtight pouch. Because the packaging is 99 percent oxygen-free, the wine can last for up to 12 months after opening. 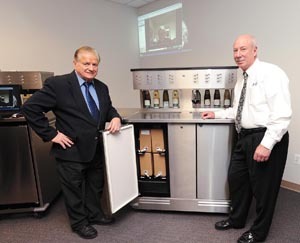 While the wine-in-a-box concept isn’t new, O’Keefe has developed a number of advances such as resilient vacuum seals, electronic inventory control, and automatic pouring geared to benefit large and small distributors of wine, including hotels, convention centers, banquet facilities, casinos, restaurants, sports arenas, and entertainment venues. With the Emerald Wine System, eight boxes of wine (the equivalent of 96 bottles) are stored in a refrigerated, stainless steel cabinet set on wheels. Each box is equipped with an encrypted bar code that constantly monitors the amount of wine poured and uploads that information to a database. If a box is removed from the cabinet, or is tampered with, the electronic sensor will report the movement or loss of product. Atop the cabinet, and set inside a glass display case, are eight bottles of wine that represent the contents below. These wine bottles are for display purposes only. Just above the bottles are eight taps that are programmed to pour a precise amount of wine. To prevent underage drinking, glasses can only be dispensed once a hotel staff member or event host reviews a person’s identification (a license card scanner accomplishes the same task). In addition, overconsumption of wine can be greatly diminished by curtailing the number of glasses dispensed to a credit card. Wineries, meanwhile, can utilize a preferred customer card system that sets the number of half-ounce tastes per customer to four or five pours, so on-premise consumption is kept at a moderate level. The machines can also be programmed to scan VIP cards or room key cards, enabling hotel guests to enter a lounge and serve themselves a glass of wine. In addition to providing a clear record of drinks poured by the glass, by an employee, or within a set period of time, O’Keefe is offering a variety of dispensers. Selections include mobile or self-serve machines, or units that can be housed in front of or behind a bar. The so-called green machine runs on electricity, although there’s an optional rechargeable lithium ion battery that provides power for use in more remote locations. The battery doesn’t power the refrigerator, which will maintain a variety of temperatures (based on the type of wine) for up to three hours (without electricity). Apart from offering more uniform inventory and dispensing controls, Emerald Wine Systems reduces packaging and shipping costs. One carton of boxed wine weighs 20 pounds, compared to 39 pounds for a case of bottled wine. What’s more, packaging and waste are reduced because there are no glass bottles, corks, labels, or capsules. Pricing and leasing options for the cabinets have yet to be finalized. O’Keefe anticipates users will be able to quickly recoup their investment, depending on volume. The cabinets will be inspected and serviced on an annual basis. A large variety of wines will be available, including offerings from Michigan, California, and Washington, as well as other wine-producing states. Interna-tional wines will be available down the road, including products from smaller wineries that wouldn’t normally distribute in the United States due to costs and a wholesaler’s preference for handling large volumes. Emerald Wine Systems was created entirely in Michigan, O’Keefe says. The system was designed and is being manufactured by J.H. Bennett & Co. in Novi, the Marvel refrigerators are made in Greenville, and the stainless steel is being fabricated by Great Lakes Stainless Inc. in Traverse City.